1. Class of 2020 & 2021 specialists who are looking for country-wide college exposure and to compete against the best in their class. 2. Specialists who earned ALL-STATE honors for their performance in the 2018 football season. 3. Specialists who performed exceptionally well at one of The Kicking Coach camps and were invited by coach Filipovic. *Would you like to attend? Send us an email with 1. your name, 2. high school name and graduation year, and 3. your accomplishments, stats, and any video that you have. We will review it and respond with an invite if you qualify. Go HERE to send us your information. This is a showcase event tailored for college prospect kickers and punters only. Strict admission standards ensure top-notch competition, high interest by college coaches, and higher commitment rate than any other showcase in the country. Relatively small number of athletes at this event allows us to thoroughly evaluate each athlete, while allowing him to showcase his best performance, and to capture it in a professional quality video. There is no waiting for hundreds of athletes to kick before you get your chance to perform. We invite only 50 competitive college prospects and do not rush them through warm up, charting, etc. Athletes get filmed and charted twice. Only the better performance of the two is sent to colleges. Here are two samples of outstanding athletes performing at this event – Hunter Niswander who committed to Northwestern and Austin Seibert who committed to Oklahoma. They both received full scholarships and both are starters on their teams. Click HERE for Hunter’s video and HERE for Austin’s video. Statistics and Video from this event are sent to every college in the country. Individual referrals and references to specific schools are available by request of athletes or universities. Athletes who accomplished ONE of the two admission requirements listed below in the 2017 football season. 1. Named to ALL STATE; 1st, 2nd, 3rd team or honorable mention. 2. Over 50% of kickoffs were touchbacks for the class of 2020. Over 35% of kickoffs were touchbacks for the class of 2021. 2. Averaged over 40 yards per punt for the class of 2020 athletes. Averaged over 38 yards per punt for the class of 2021 athletes. Filip Filipovic and Assistant Coaches with NFL or big time college experience. Lake Forest College Football Stadium. Located on Lake Michigan, about 25 miles north of Chicago, Lake Forest College Campus is one of the most beautiful campuses in the country. Football stadium is surrounded by endless woods and multi-million dollar mansions owned by the likes of Michael Jordan, Vince Vaughn, etc. This was also the training camp facility of the Chicago Bears for many years – including the 1985 team with coach Ditka, Walter Payton, Jim McMahon, etc. In addition to aesthetic value and history, trees around the stadium block most of the wind – making this an outstanding location to have a career day at a kicking event. Athletes will attempt 15 field goals. Distances are from 30, 35, 40, 45, and 50 from left hash mark and right hash mark. Also 42, 45, 47, 50, and 52-yard field goals from the middle. Athletes who make at least 10 out of 15 will earn bonus kicks from 55, 57, 60 yards out. Class of 2020 kickers have to kick field goals off the ground. Class of 2021 kickers are welcome to use a 1 inch or 1/2 inch block if needed. Athletes will repeat the charting session on Sunday. Kickers will attempt 6 kickoffs from the 35 yard line. We will average top 4 kicks. We will not measure handling time (catch to kick). But it is recommended that punters move at 1.4 to 1.6 second speed. 11 AM Recruiting Meeting – Review of Day 1. Recruiting plan of action and timeline. *If an athlete cannot attend both days, he is welcome to attend just one. He will just have less charting opportunities than athletes who attend both. Once athlete has finished charting on Sunday, he is welcome to leave the event. It is not necessary to stay until the very end. Optional Add-On: Skills video production with professional reference: $270. You can mail a check in or request an invoice for online payment (Coach@TheKickingCoach.com). Payment is due by July 10th. Lodging is not provided. Lake Forest is a beautiful and safe suburb of Chicago. 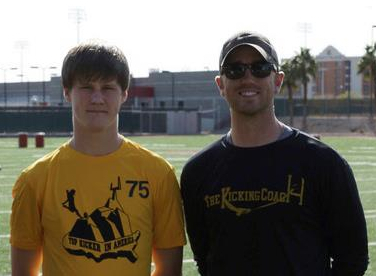 "Coach Filipovic, The Kicking Coach, has been Hunter's kicking/punting coach since his freshman year of high school. Hunter tried out other camps, but very early on, found Filipovic's coaching to be incredibly beneficial. Filipovic was in the NFL, and although he could draw hundreds to his clinics, he purposefully limits clinic size. And they sell out early! 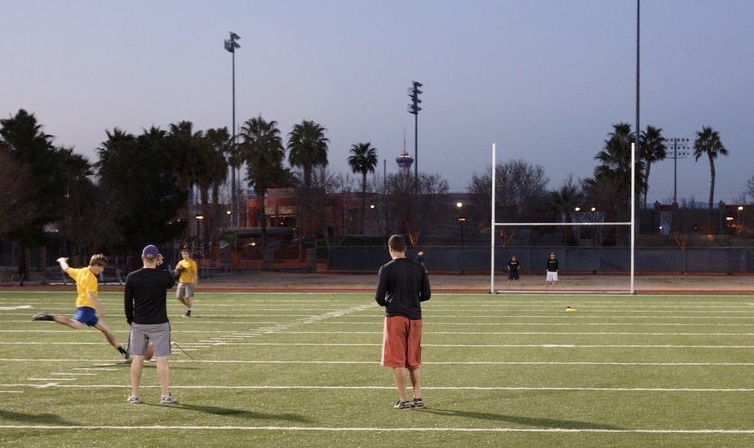 There are always numerous current D1 and/or NFL kickers/punters helping at his events. This, together with Filipovic's excellent training, makes for great coaching, as well as coach to athlete ratios. 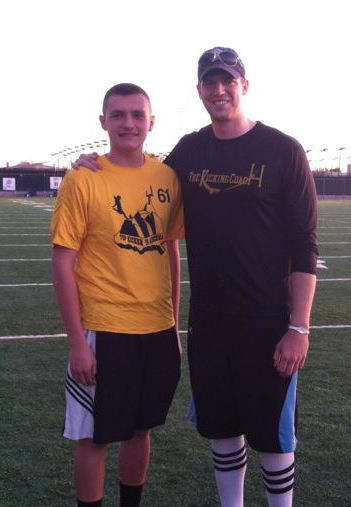 At Top Kicker In America 2012, Hunter spent the day learning from the New England Patriots' punter Zoltan Mesko, NFL kicker Billy Cundiff, Filip Filipovic and more. 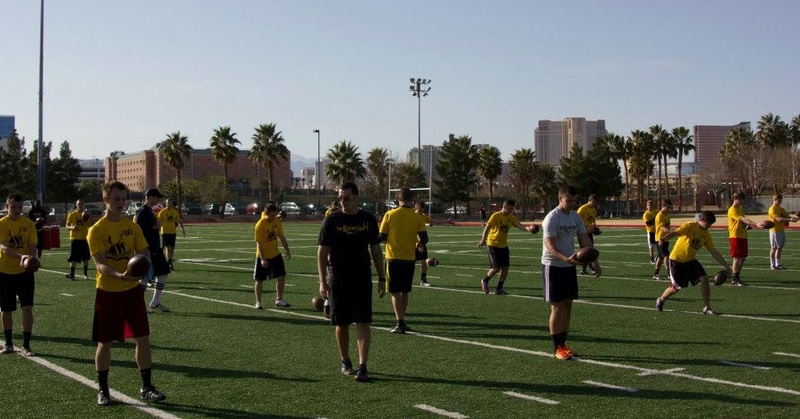 These D1 and NFL specialists lend first-hand, feet-on experience to the training, and we credit Filipovic's coaching regiment with our son's positive results. Hunter made all-state his junior year, and it's looking good for his senior season too. In high school games, he's had five 50-plus field goals, now kicks near 100-percent touchbacks, has a strong punt average (80-yard long), and is getting ready to break the state record for most consecutive PAT's. After being named Top K/P Combo in the Country at Filipovic's 2012 TKIA event, Hunter committed to Northwestern University. Filipovic's training walked Hunter from his first attempts at kicking, to where he is today. He was extremely instrumental and pro-active in advocating for Hunter during his recruiting process. While other organizations charge for everything from Website visibility to videos, Filipovic did not. He put together a highlight video for our son, as he did for all the guys who attended TKIA, at no additional charge. He then sent the video all over the country. Again, no charge. It's a quality situation, and Filip Filipovic is an earnest and honest coach. Hunter is excited to continue learning from Filipovic through his college years, hopes to go NFL, and can't wait to give back, by helping at one of The Kicking Coach clinics...very soon!" I just wanted to send you a shout out! THANK YOU, THANK YOU, THANK YOU! WMU's coach Wenger talked very highly of you and what you had to say about BLAZE, so you are the reason he will be a BRONCO next fall! Thanks for all you did for Blaze! This Watson family appreciates you! I attended your camp in January (TKIA 2013) and had a great time - even in the pouring rain. I just wanted to let you know I received 2 offers. One from Yale and the other from University of Iowa. I wanted to let you know I verbally committed to Iowa. "Attending The Top Kicker in America Showcase was instrumental in getting an offer from a DI school. His camp was professionally ran and the instruction from him and his staff was great. The best part if attending was getting the video and the capability to utilize Filip as a reference. 9 months after the showcase, Filip was still taking calls from college coaches interested in my son. 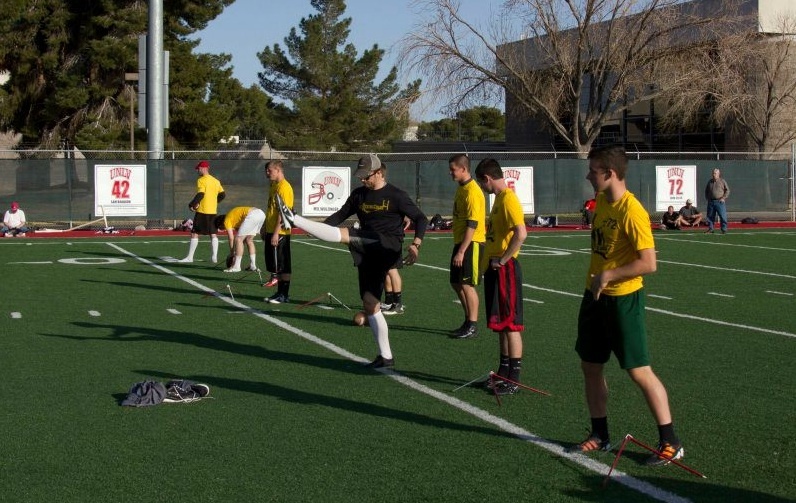 We attended a few kicking events, but this one was the most helpful all around."